When Anton Hallak says he is mining a mountain of electronic waste, he is not being hyperbolic. Sitting at the edge of Hebron, Palestine, are literal heaps of old technology: computers, discarded phones, and other pieces of IT that are no longer useful. 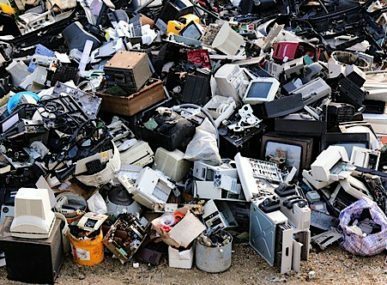 There are enough public health concerns that come from having e-waste lie around — but what is also threatening the environment is the ad hoc processing of these discards in order to extract the precious metals contained within. Meet Palestine’s burners: residents who disassemble and treat e-waste not in factories, but by burning it near their homes and public water sources. A study published in 2013 found that in the last decade alone there were more than 600 burn sites active in the Hebron Governorate. Hallack is the chemical engineer whose business, Ecotech Recycling, looks at this as an environmental nightmare — but also as a social business opportunity. As an environmental scientist at Ben-Gurion University of the Negev, Garb has spent years researching the trade of e-waste between Israel and Palestine, and was the author of the 2013 study referenced earlier. Garb and his team are currently supporting several projects similar to Ecotech Recycling, offering training, counseling, and the chance to network with international partners and experts. His own pilot project has received support from the Swedish government and, among other work, established an alert and response network that has led to a 40% reduction in burning. 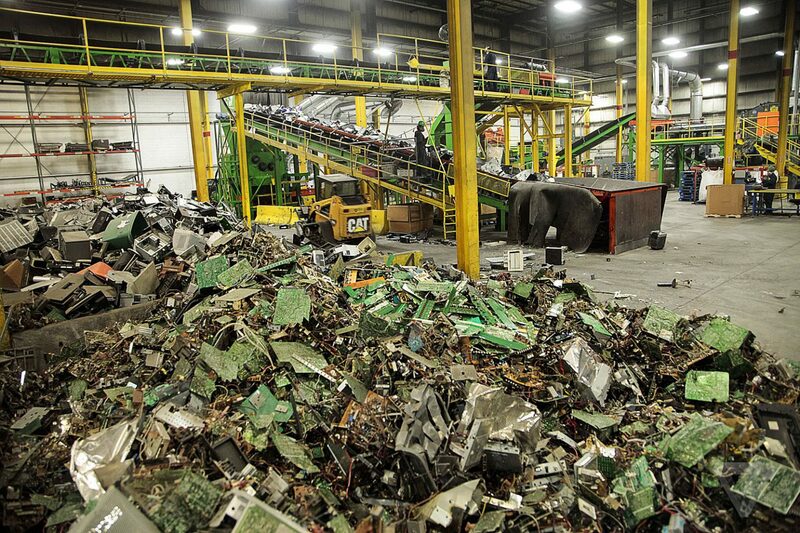 Ecotech Recycling’s solution still involves the extraction of precious metals from e-waste — but it does so without burning the components. The process has different stages, the first being the disassembly and sorting of components. From there, a specialized machine heats the components containing precious metals, concentrating each into a mineral-rich liquid which Hallack plans to sell to refineries in Europe. Components lacking precious metals are then pulverized by another machine, and can be used as an alternative to sand in the construction sector. Ground-up e-waste can also be mixed with glue to produce sound insulation panels and a fiberglass material. 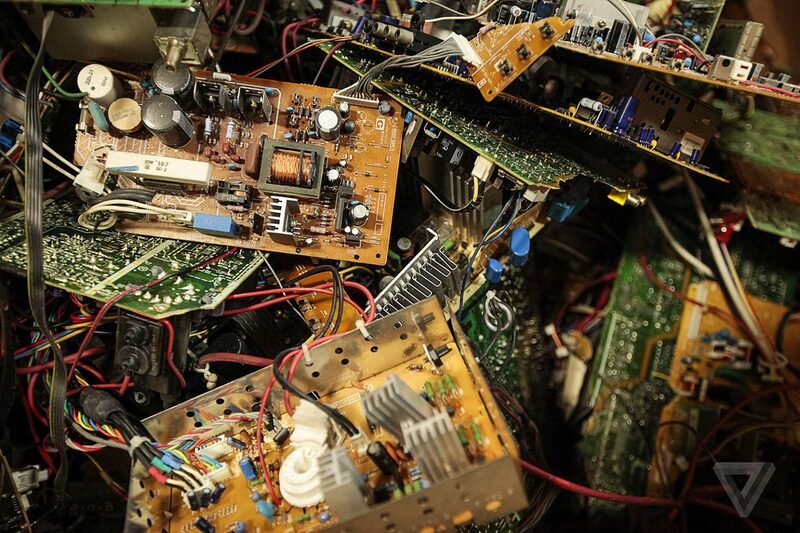 The ultimate goal is to create a circular economy for the e-waste. This is an improvement from what currently happens to the leftover plastic. “Most of it right now is either thrown on the side of the street or added to an unofficial landfill. 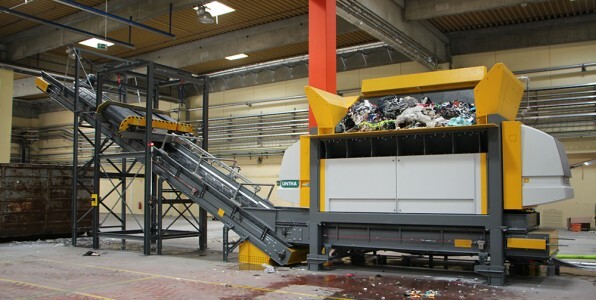 We want our operations to be zero-waste,” Hallack adds. There is evidence of this already being successful. Garb’s project has, for example, reduced burning by 2.5 tons of electric cable a day, by giving people the option to grind rather than burn. As Garb mentions, it will not be possible for all businesses to transition to clean recycling — but many more can. 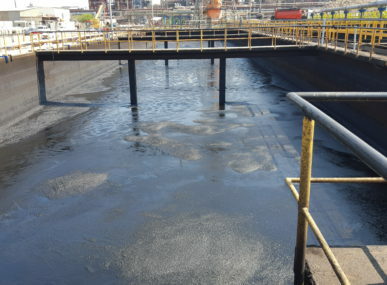 “At some point, the polluting industry will become harder to operate, and the benefits of a more formal operation will increase. Small businesses may need to group together to operate,” he adds, of the many independent operations currently working in Hebron’s hills. 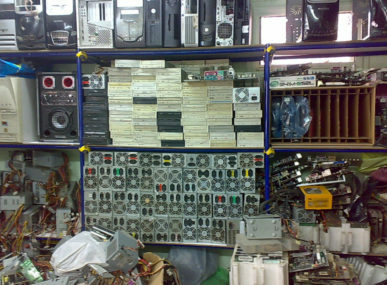 Public pressure to address the issue of e-waste is still fairly new in Palestine. In as recently as 2010, most municipalities in the country had never even heard of e-waste — an obvious reason for a lack of policy around the issue. Today, Hallack and Garb say things are slowly changing. Residents living near burn sites are seeing the environmental effects of their e-waste processing first-hand. Before they made money by stripping e-waste of precious metals, agriculture was the main income for residents in the region. In Idhna, a town in the Hebron Governorate, the burning of e-waste has contaminated soil and covered the crops that can grow in an unpleasant layer of black soot. The area where more than 1,500 olive trees once stood has been disfigured into smoldering rubble, once arable soil dyed gray and black. A doctor at the Idhna Medical Center reports that 18 residents under the age of 35 have come to him in the last year with different forms of cancer. According to Hallack, the public health and agricultural concerns caused people to file complaints with the government, but one ministry recommended speaking to the other, creating an unproductive loop. Burn site monitoring by the Palestinian police is inexistent during nighttime hours, and the private sector has no desire to be involved, he adds. Sitting at the intersection of public and private is where Hallack wants Ecotech Recycling to make a change. He is working closely with Garb on the academic side of business, and is currently petitioning agencies like the European Union and UNDP to support the purchase of his two e-waste processing machines, a cost of around EUR 500,000. “We really need some agency that is willing to take this important risk with us,” he says. As around the world, people in Palestine are getting used to technology very fast, Hallack says, so a solution could not come too soon. Photos: Courtesy of Ecotech Recycling.